Nick Wingfield, has written a nice review of MileLogr for the New York Times. …a lot of people have to take the deduction for car mileage themselves because their employers do not provide reimbursement. And they may be interested in a new Web service, MileLogr, which is designed to make logging of business trips in personal vehicles more automated and easier. You can try MileLogr today, for free, at www.milelogr.com. The team is extremely pleased to announce that MileLogr is now officially out of beta and ‘real’. Since we released the Beta last September we have been feverously working on addressing what we learned from our beta customers. A huge thank you to all of you who tried the beta and gave us feedback! We got a nice write up on GeekWire this morning explaining the launch and the product. Head to www.milelogr.com now and give it a try! We had some website copy that said “Get your mileage log for 2012”. MileLogr can go back in time and create mileage logs for time periods in the past! It is like a time machine. As long as you used your calendar in the past for most of your appointments, MileLogr can read your calendar entries (they are still there!) and generate a mileage log for the trips you took! Give it a try at http://www.milelogr.com. There are many different approaches to tracking mileage. Most people use pen and paper to try to keep track of their trip details, sometimes recording odometer readings, sometimes using addresses. Doing so requires diligence and hard work. Log keeping software. Keeping a digital log, either on a PC or a Smartphone, is one approach to tracking mileage, appointments, deductibility, and location. You still need to be diligent about entering all trip details every time you travel, but can do so without having to resort to pen and paper. They’re expensive. The device itself costs several hundred dollars, then in addition, you’ll have to pay a subscription fee to continue to use its service. If you forget to turn the device on, or forget take it with you, the trip doesn’t get logged. You’re stuck without any data, even if you recall the appointment and where it was. If you use your vehicle for business and personal, there’s no way to distinguish between which trips were business, and which were personal. Smartphone apps. Apps that you can download onto your smartphone attempt to mimic GPS logging devices. They do so by using your phone’s GPS sensor to track where you’ve driven. These solutions suffer the same problems as GPS devices, but have an additional fatal flaw: GPS logging on smartphones doesn’t really work in practice. GPS drains smartphone batteries, and thus can only be enabled infrequently. In addition, most smartphone platforms (such as iPhone) don’t allow this type of battery-hungry location-based application to automatically run all the time. MileLogr works because it uses information you have already entered about where you travel. MileLogr helps you work smarter, not more, or longer. You’ve already done the work to create calendar entries on your digital calendar; MileLogr simply reads that information and presents it to you in a way that enables you to benefit further from the work you’ve already put in. And if you haven’t put location information into each entry on your calendar, MileLogr can help in a few ways: by flagging it for you in the MileLogr web calendar, then letting you type the information in; or by letting you use a map to pinpoint where the appointment was held. And like any good habit, once you’re accustomed to entering location information into your appointments, it’ll become second nature… and claiming all your eligible deductions will be that much easier. No double-entering from paper to computer, no trying to remember where you were last week, no figuring out the mileage or whether the miles on your car are deductible. MileLogr makes it easy to maximize your deductions, and minimize the work to get them. One other benefit of MileLogr, which truly sets it apart, is the ease with which it can look through past appointments. MileLogr can access calendar entries you put on your calendar last year, the year before, or as far back as you’ve been u sing a digital calendar. Imagine if the IRS contacted you tomorrow to do an audit for 2010: MileLogr can help you create the evidence required to prove the mileage deduction you took was valid, even if you used an inaccurate pen and paper method to initially submit your return. With MileLogr, you get a web-based solution that integrates with your existing calendar, presents your list of appointments in an easy-to-manage format, and generates the reports you need. You select which appointments are deductible with the click of a button, and MileLogr does all the calculations and reporting for you. No more scratching through paper-based mileage logs, guessing at deduction amounts, or toiling through online maps to figure out your mileage. Do it in a few clicks, get the report at your fingertips, and get on with what you really want to do — reporting your mileage deductions quickly, painlessly, and accurately. You can try MileLogr for free now at www.milelogr.com. Keeping a paper-based diary or log book where you write down your odometer readings after each trip. Keeping a digital-based log book app on a mobile phone. Using a dedicated GPS logging device installed in your car. Using your calendar to determine where you drove, after the fact. When it’s time to create a mileage log get out your calendar (if it’s online, connect or open the calendar program you use, like Outlook). For every meeting you put on your calendar, decide whether the meeting was business related or not. If a meeting was business related, use the notes you kept to figure out where the meeting took place. Use Google Maps or Bing Maps to figure out the distance you drove to get to that meeting from the previous meeting (or home). Put all of this into spreadsheet or other document you can print. This works well for many people. However it, too is a lot of work. MileLogr does all that work for you! If you’re using an online calendar system such as Apple’s iCloud, Microsoft’s Office 365 / Exchange, or Google Calendar the information in your calendar is stored online. MileLogr works by reading that location information (whether a business name, the name of a client, or an actual address) from your online calendar provider, and using sophisticated mapping technology to determine the driving distance between calendar entries. MileLogr integrates with your digital calendar to create mileage logs for taxes, expense reports, and timesheets. In other words, MileLogr synchronizes with your calendar information just like many calendar applications do – such as Microsoft Outlook, the Android Calendar app, the iPhone Calendar app, and others. Just as multiple devices can connect to your email account and display emails or appointments, MileLogr connects to your calendar provider (which is typically the same as your email provider) to display and present your appointment information… in this case, to easily create appointment-related mileage reports. The beauty of MileLogr’s approach is how it leverages the work you’ve already done: if you’ve created appointment in your digital calendar, including location information, MileLogr doesn’t require any additional information to create a mileage log. And for any calendar entries that are missing location information, or the location is ambiguous, MileLogr makes it easy to clarify or complete. You can type in the location, or use familiar maps to drop a pin where the appointment was located – MileLogr figures out the rest. With MileLogr, claiming your deductions is fast, easy, and intuitive. People sometimes put business and personal appointments on their calendars. MileLogr makes it easy to identify which appointments are business related (and therefor, should be part of your mileage log). MileLogr also supports recurring appointments, so marking one appointment as deductible (or not) also marks all other appointments in the recurring set. In order to determine the distance of trips at the start and end of each day, MileLogr uses a “home address”, which you specify, from which to calculate mileage to and from appointments. With the home address, and locations in each of your appointments, MileLogr has all the information it needs to create a comprehensive list for each deductible appointment, including mileage, for you to report your deductions. It even calculates your anticipated deduction amount based on current rates – so you’ll know how much you’ll get to deduct as soon as the report is generated. MileLogr connects to your calendar service. Supports Google, Exchange, Office 365, Hotmail/Outlook.com, Apple, and Yahoo. For example, if you use Google Calendar you would enter your GMail address. Specify the date range you want a mileage report for. Enter the addresss where you start and end your day (typically a home address). 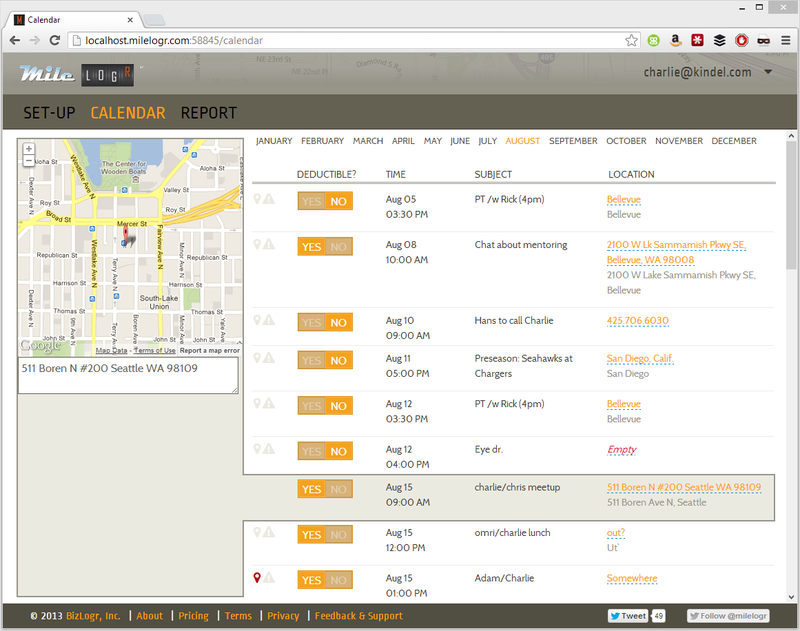 MileLogr analyizes your calendar to geo-locate meetings. Adjust the location of calendar entries using the map. Identify which meetings are deductible for tax purposes. MileLogr determines distance driven between deducitble meetings. Purchase the full report. See pricing. Save the report to Excel, copy to clipboard, or print it. Download a Sample MileLogr Report. MileLogr to Come Out of Beta Soon! The team is busy getting MileLogr ready to come out of beta. If you would like to be notified when it is ready go here and enter your email address.